Somewhere out there, it had to exist. Somewhere, while Jakarta steamed, warm blue water lapped cream-coloured sand. Somewhere along the jungled coast between Anyer and Pelabuhan Ratu, within a few hours’ drive of Jakarta, it had to exist. We wanted to find it. 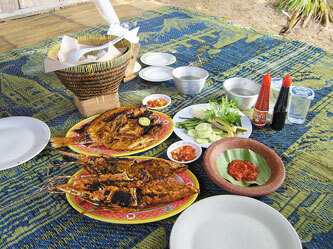 We also wanted to immerse ourselves in nature and munch heartily on real Sundanese food. It didn’t quite happen as we expected, but we ended up getting all three plus sunburn. We took the Jalan Tol west to Serang, then headed south on the coast road towards Labuan. It didn’t look very promising at first – it’s a dusty, industrial stretch of road with rocks-only beaches and dirty water. Tourism is one of the main industries here (along with steel and petrochemicals- yum!) and there are lots of seedy guesthouses and mile after mile of kitsch pink concrete karaoke parlours. There are a few good hotels, all a bit expensive for what you get, but nothing that fit our ‘back to nature’ ideal. That said, if you do get stuck here you could do worse than staying at the Nuansa Bali or Ekowisata Carita Banten. We found one more place- a private beach called Pondok Anda with only two (rather ratty) bungalows run by a man named Pak Udi. One very good reason to stop here though is the Bandulu watersports center. They have a massive selection of sailing dinghies, catamarans and windsurfers. If it wasn’t for the shipwrecked barge on the beach, this would be Java’s most idyllic sailing spot. The operation is twinned with the Ancol Windsurfing Club and is clearly signposted from the main road. Further south the development begins to thin out- with the exception of the Sol Elite Marbella. This mind-numbingly ugly jumble of concrete boxes enables tourists to completely deny the existence of anything natural or beautiful on their holiday. I suppose it makes going home to Jakarta easier. It has a stretch of beach but it is almost always in the shadow of the hotel and the two-metre high cement walls around it. As the developments thinned out, the road grew quieter and there was more and more green around. But there were still no good beaches. Most of the coast along here is rocky reef which is great if you like lobster but not so good for easy swimming. ‘We already passed Sambolo,’ said our driver. ‘Okay, but could you please stop anyway,’ I said (I was learning). 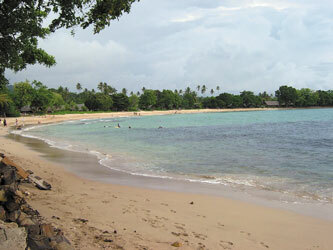 Sambolo beach is idyllic. It’s got a clean sandy bottom and is protected from the open sea by two reefs that reach out to each other across the bay. The 7-bed bungalows are all made of traditional materials (ironic as it’s owned by a foreigner, unlike all the pink concrete monstrosities we’d passed), face the sea and have their own barbecue pits. Most of them are leased by embassies and foreign companies but the ones at the northern end of the beach can be rented by anybody who turns up, it seems. Three minutes after we got out of the car the Great Banten Beach Hunt was officially discontinued. Sambolo wasn’t in need of any ‘discovering,’ but it is still very very nice. It’s quiet, it’s in tune with its surroundings and its surroundings are very nice too. The sea is nearly always calm and clean, making it perfect for families with small children. One of the local massage ladies who hangs around Sambolo, Ibu Sarni, offered to cook us dinner. We took her up on the offer and were treated to some absolute gems of Sundanese cuisine. Could life be any sweeter? The next day we took a walk up to a waterfall a few kilometres south. It’s a fairly easy walk but it does get a bit rocky and slippery towards the end. The waterfall itself is stunningly gorgeous and you can jump from the top and swim down the river before climbing up and out through the jungle. It’s popular with locals and we had a really good time sipping Teh Botol from one of the warungs that somehow has appeared there and singing Beatles songs with some guitar-equipped local lads. There’s also an eco-resort nearby that offers lectures on the uses of the plants that grow in the area. Just ask the way to the air terjun. The next day, as we headed back to Jakarta we stopped at one of the beachside ikan bakar places a few kilometres north of Sambolo. Like all the others, it’s a series of miniature huts in which you can while away your weekend with cheap lobster, views of Krakatau and a very lazy atmosphere. Sundanese cooking is healthy, tasty and credited with giving Sundanese women the halus-est skin in Indonesia. It simply must be tried- the specialities here are snapper and lobster. Pak Udi’s opening price was Rp 600,000 per night. Bargain hard! Don’t worry- if you’re at Sambolo, she’ll find you!